Join us for a SATURDAY morning gentle practice (with one bonus SUNDAY practice a month – check our event schedule)! Yoga for ALL levels; no experience required. Taught by Lisa Dunaway, RYT 200. Come gain strength, flexibility, and calm. 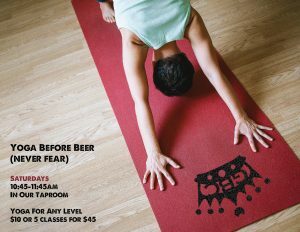 Have a beer during or after the yoga practice, or not at all! This yoga is not just for beer drinkers. Please dress comfortably, but not too baggy. Bring your own mat if you have one. We have some mats for use courtesy of our friends at Studio Exhale. $10 for 1 class or 5 classes for $45. Seniors over 65 and BSU students (with valid ID) are $7.50 for 1 class. Must be over 21 (sorry)!